Today we share with you a surprise proposal that we set up in Las Vegas, Nevada. 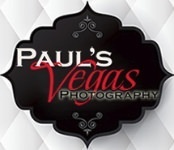 Here at Paul's Vegas Photography we strive to make everything as easy and seamless as possible. Chris called us and wanted to propose to his future wife while they were on vacation. We decided on a location and they walked there in 120 degree weather. Once he arrived at the location that we had decided on, he surprised her with that big question. She said YES! We are very thankful for the surprise to picked up by www.biglovesmallweddings.com and published this week. We share with you Chris's surprise proposal!